Goethe referred to his ballad Die Braut von Korinth (‘The Bride of Corinth’) as his ‘vampire poem’. It is true that there is a macabre element in it strong enough to have upset some of the more seriously inclined of the poet’s contemporaries, who felt that a great mind like his ought to have been devoted to higher things. But there are higher things in it too, the most interesting of which, from an operatic point of view, is the rudimentary Liebestod at the end: to be united at last in the marriage denied them in life, the blood-sucking bride and her bridegroom victim are consigned at her command to the flames of the funeral pyre. Their fate—in a Corinth split between converts to the new Christian religion of self-denial and adherents of the pleasure-loving gods still in place on Olympus—symbolizes to a bizarre extreme the rift in civilization as one faith declines and is replaced by another. In the hundred years between the publication of Die Braut von Korinth and the first (posthumous) performance of the one complete act of Chabrier’s Briséïs, Goethe’s ballad had become a minor cult with French writers and composers. Camille du Locle had adapted it as the libretto for Duprato’s La fiancée de Corinthe, which was produced at the Paris Opéra in 1867; Anatole France had written a verse drama Les noces corinthiennes, a frank celebration of paganism, in 1876 (Henri Büsser made an opera of it forty-six years later); and Ephraïm Mikhaël had collaborated with his symbolist colleague Bernard Lazare on a ‘dramatic legend’ in three acts, La fiancée de Corinthe, which appeared in Paris in 1888. By the time Chabrier got to work on the story the Liebestod element had become the principal and culminating feature. The vampire had disappeared, to be replaced by a bride who returns from the dead to claim her long-promised husband, as in Goethe’s ballad but now with no predatory intent. Both these developments had been made in Mikhaël and Lazare’s La fiancée de Corinthe which, though the structure was to be reshaped and the names of the characters changed, is clearly the basis of Briséïs. A significant refinement in the opera—introduced, presumably, by Catulle Mendès—is that the Christian-convert mother condemns her pagan daughter to a life of chastity as a bride of Christ not merely to save her own skin but so that she might continue to pursue her missionary work among the unconverted Greeks. Most important of all, the lovers’ union in death at the end of Briséïs inspires a reconciliation between the conflicting elements of Christianity and paganism. If Chabrier over-estimated Mendès’s literary abilities he was not alone among his contemporaries in doing so. Debussy was to see through the fashionable reputation to the (as Dukas later described it) ‘Parnassian bric-à-brac’ underneath when he abandoned his ill-advised collaboration with Mendès on Rodrigue et Chimène in 1892. But Chabrier was quite happy with the ‘very beautiful verse’ Mendès had written for Gwendoline, their first operatic project, and he was confident that Briséïs—which he described as ‘a paraphrase in three acts and four tableaux of Goethe’s ballad The Bride of Corinth’—would be ‘tender, poignant, super-passionate’. Declaring that his score would be the last word in modernism, Chabrier confessed that he did not know if it would be French but he was sure it would not be Wagnerian. ‘I try to inoculate myself with the aesthetic of the man of bronze’, he said, ‘but never with his music.’ In fact his music is harmonically ten years ahead of its time and is very French except where it is too plainly reminiscent of Wagner, which is mainly in the more dramatically significant modulations and in the shape of some of the leitmotifs. In August 1888 Chabrier reckoned that it would take him sixteen months to get to the end of Briséïs. Six years and one month later he died having completed the first act and leaving no more than a few variably decipherable sketches for later episodes in the opera. There are many reasons for Chabrier’s failure to achieve what he regarded as the climax of his life’s work. There were early delays caused by Mikhaël’s apparent unwillingness to get on with it, which the composer found intolerably irritating (although, had he known that the unfortunate poet was to die at an early stage in their collaboration, at the age of twenty-four, he would obviously have been more understanding). Chabrier had money worries at this period too: so, although he was a hopeless teacher, he had to give lessons and devote time to writing music which he could readily sell—hence the composition of some of his most delightful mélodies, including a setting of Mikhaël’s L’île heureuse and the farmyard songs to words by Edmond Rostand and Rosemonde Gérard. He had to keep travelling to Germany where, thanks largely to the efforts of Felix Mottl, his operas were far more in demand than they were in France. His wife’s already delicate health was deteriorating. Most distressing of all, his old nurse, Nanine, of whom he was inordinately fond and who had lived with him all his life, died in 1891, leaving him unable to work for months on end. He could probably have coped with all that but for the basic problem that, at the same time as he was making a supreme effort to expand his creative resources, his final illness was inexorably contracting them. On a visit to Bayreuth in 1889 he had seen Parsifal for the first time and (with Van Dyck ‘quite extraordinary’ in the title role) found it overwhelming: ‘One comes out after each act absolutely overcome with admiration, bewildered, distraught, with tears running down one’s cheeks.’ If he did not at first have Parsifal-esque ambitions for Briséïs he certainly had by now. But, as he forced himself to work on a structural and moral scale he had never previously envisaged, the paralysis associated with the terminal stage of syphilis was advancing on him. Even as he finished the first act Chabrier seemed to sense that he would not get much further: ‘Mottl could perform the first act, which I finished orchestrating the day before yesterday’, he wrote to Van Dyck in Germany on 29 September 1890. ‘I have worked my guts out’, he added inelegantly but ominously. He played what there was of the work to his friends in Paris and left for his country retreat at La Membrolle in Touraine ‘to hide himself away like a sick animal’. It was not until the end of March 1894—after a period of years spent mainly at La Membrolle where he could scarcely bear to let the score of his ‘dear Briséïs’ out of his sight—that he finally gave up and got Vincent d’Indy, the best-equipped among his composer friends, to undertake to finish the work for him. When eventually called upon to do the job, however, d’Indy, for all his good intentions, had to extricate himself from his promise. He was dismayed to find that what he had been led to believe would be just a matter of orchestration would really be a labour of composition from a few fragmentary sketches; and, anyway, he could not possibly work with Mendès’s libretto. Chabrier’s heirs had no more luck with Antoine Mariotte, Alfred Bruneau, Claude Debussy, Georges Enescu or Maurice Ravel, all of whom were invited to complete the work at one time or another. 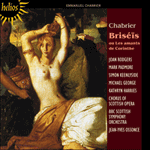 But, as the composer himself was aware and as d’Indy so wisely pointed out, ‘what there is of Briséïs can be perfectly well played and sung in concert and will be very interesting in that form’. The first act was, in fact, introduced to the world by Charles Lamoureux at a Chabrier memorial concert in Paris on 31 January 1897. The first staged performance took place in Berlin in January 1899 under the direction of none other than Richard Strauss (who seems to have remembered something of the work when he came to write his Salome) and the first Paris Opéra production opened four months later. In spite of his large-scale structural ambitions in Briséïs, Chabrier still preferred to construct his scenes as a succession of separable (if not exactly separate) numbers. While rejecting Wagnerian ‘declamation’, which he considered very boring, he insisted nonetheless on threading a Wagnerian network of leitmotifs through his orchestral textures. As he confessed, it was ‘a long and meticulous job’ involving the ‘twisting and torturing’ of themes which he was determined not to present in a string of literal repetitions. Whatever the problems, Chabrier’s motivation rarely seems anything but spontaneous. There is an appealing freshness, for example, in the rising and falling sixths of the serene sailors’ song at the beginning, and the ‘Briseis’ motif—introduced by the strings at the point where Hylas first mentions her name and then repeated in all kinds of variants before her first appearance—is as graceful as it is brief. The painful message of the harmonies associated with Briseis’s first mention of her sick mother is clear from the first tritone. On the other hand, which god it is—Olympian or Christian—who has given Thanasto temporary relief from her illness and who is briefly represented by a firmly diatonic melody in the orchestra, is not made clear at this point. Hylas’s invocation of Eros, the intervals of his vocal line gradually expanding over an ostinato of bounding octaves, is an extraordinary expression of pagan energy. One of the more Wagnerian of Chabrier’s motifs is the one which, striding up from the bass in fifths and fourths, accompanies the vows of Hylas and Briseis as they swear by ‘l’auguste Kypris’ (or Aphrodite) to love each other until their very last days. More characteristic of Chabrier, and even more significant dramatically, is the legato three-note descending phrase associated with Briseis’s apparently eccentric but actually ominous insistence that love must survive beyond death and into the tomb. Echoes of the lovers’ joyous anticipation of their wedding day—Briseis singing from the shore, Hylas from the ship—are combined with a varied repeat of the sailors’ song as they set sail again. Several of the foregoing themes are reviewed in the orchestral interlude accompanying Briseis’s reflections as she is left alone at the end of the scene. The suffering tritones reappear at the beginning of the third scene, both in the orchestra and in the choral exclamations of ‘Hélas!’. One or two other painful motifs associated with Thanasto contrast most effectively with the tenderness of the melody symbolizing the daughter’s love for her mother as Briseis first addresses Thanasto in ‘Mère, qui me portais …’ But the most memorable melody of the scene—and potentially one of the main themes of the opera—is the triumphant march tune which, in her missionary zeal, Thanasto twice sings to the words ‘Pour qu’au jour des moissons superbes’. If the presence here of a clear echo of the Chanson de l’alouette from Le roi malgré lui is frustratingly puzzling, the significance of a new vow motif in descending minor thirds, introduced as Briseis promises to give her life to save her mother, is all too clear. The last scene—Chabrier’s supreme creative effort—begins with an orchestral development and choral apotheosis of a simple diatonic theme briefly anticipated earlier and associated now with Apollo. The Catechist enters with his own motif in a fanfare of trumpets and prays for Thanasto in Gregorian chant. But far from insisting on the difference between them, Chabrier combines the Christian and Apollonian themes in a grandly ecumenical orchestral gesture. So the way is prepared for the eventual reconciliation between faith in the Olympian gods, now invoked with crown-imperial harmonies by Stratocles, and the radiant Christian message of the Catechist. There is no prospect of reconciliation of the dilemma facing Briseis, however. After a conflict between the motifs representing the two vows, her own to Hylas and her mother’s to God, she is compelled to comply with the latter and is banished to a life of chastity, accompanied by the melody representing her love for her mother and the latter’s triumphant march theme. In his pleasingly affectionate but often misleading little book on Chabrier, Francis Poulenc gives a brief (and inaccurate) description of the events so far and adds, ‘I do not know what would have happened in the following acts’. But it is all there in the libretto, which was published complete (with the vocal score of the first act) in 1897. Once she has made the Christian vows necessary to save her mother, Briseis kills herself and then calls upon Hylas to join her in the nuptial grave—which, after breathing in the deadly scent of the flowers she offers him—he joyously does, to the wonderment of Christians and pagans alike. This recording is of a concert performance given in Usher Hall during the 1994 Edinburgh Festival—the first performance ever in Britain, and the first for a long time anywhere. Goethe fit allusion à sa ballade Die Braut von Korinth («La fiancée de Corinthe») comme étant son «poème de vampire». Il est vrai qu’on y retrouve un élément macabre assez puissant pour avoir troublé quelques-uns des plus sérieux contemporains du poète, qui ressentaient qu’un grand esprit comme le sien aurait dû se consacrer à des choses plus importantes. Mais on trouve aussi certains points importants dans cette œuvre, le plus intéressant d’entre eux étant, au point de vue de l’opéra, le Liebestod rudimentaire présenté à la fin. Pour être finalement unis par le mariage, qui leur avait été refusé de leur vivant, la fiancée assoiffée de sang et son époux-victime sont envoyés, à la demande de la première, aux flammes du bûcher funéraire. Leur destin—divisé comme à Corinthe entre les convertis de la nouvelle religion chrétienne du refus de soi, et les adhérents au culte des dieux olympiens toujours en place, amants du plaisir—symbolise, de façon bizarrement extrême, la lutte qui se produit au sein d’une civilisation lorsqu’une croyance est en déclin et qu’elle est remplacée par une autre. Durant les cent années séparant la publication de Die Braut von Korinth et la première représentation (posthume) de l’acte complet de Briséïs de Chabrier, la ballade de Goethe avait acquis un certain pouvoir de culte mineur auprès des écrivains et compositeurs français. Camille du Locle l’avait transformée en un livret pour La fiancée de Corinthe de Duprato, présenté à l’Opéra de Paris en 1867; Anatole France avait écrit un drame en vers, Les noces corinthiennes, une célébration franche du paganisme, en 1876 (Henri Büsser en fit un opéra quarante-six ans plus tard); et quant à Ephraïm Mikhaël, il avait collaboré avec son collègue symboliste Bernard Lazare à une «légende dramatique» en trois actes, La Ffiancée de Corinthe, présentée à Paris en 1888. Alors que Chabrier commençait à travailler sur ce récit, l’élément Liebestod était devenu le point culminant et principal. Le vampire avait disparu, remplacé par une fiancée revenue d’entre les morts pour réclamer son époux tant promis, tout comme dans la ballade de Goethe, mais cette fois sans aucune intention prédatrice. Ces deux développements avaient été incorporés à La fiancée de Corinthe de Mikhaël et Lazare, qui, malgré la nouvelle structure et les nouveaux personnages qui s’ensuivraient, constitue clairement la base de Briséïs. Ce qui fait le raffinement significatif de l’opéra—introduit, vraisemblablement, par Catulle Mendès—est la mère, convertie au christianisme, qui condamne sa fille païenne à une vie de chasteté en tant qu’épouse du Christ, non seulement pour sauver sa propre personne, mais aussi pour lui donner la possibilité de poursuivre son travail missionnaire parmi les Grecs non convertis. Le point le plus important, l’union des amants dans la mort à la fin de Briséïs, inspire une réconci­liation entre les éléments conflictuels du christianisme et du paganisme. Si Chabrier avait surestimé les capacités littéraires de Mendès, il n’était pas le seul parmi ses contemporains. Debussy aurait bientôt l’occasion d’entrevoir, derrière la réputation en vogue (comme Dukas le décrivit plus tard), le «bric-à-brac parnassien» sous-jacent, lorsqu’il abandonna sa collaboration malavisée avec Mendès pour Rodrigue et Chimène en 1892. Mais Chabrier était plutôt satisfait du «très beau vers» que Mendès avait écrit pour Gwendoline, leur premier projet d’opéra, et il était sûr que Briséïs—qu’il décrivait comme «une paraphrase en trois actes et quatre tableaux de la ballade La fiancée de Corinthe de Goethe»—serait «tendre, émouvant et extrêmement passionné». Déclarant que sa partition serait d’un modernisme du dernier cri, Chabrier confessa qu’il ne savait pas encore si elle serait française, mais il était sûr qu’elle ne serait pas wagnérienne. «J’ai essayé de m’inoculer de l’esthétique de l’homme de bronze», déclara-t-il, «mais jamais de sa musique.» En fait, sa musique est, au point de vue harmonique, dix ans en avance sur son temps et aussi très française, à l’exception des passages où elle rappelle Wagner de façon trop apparente, principalement lors des modulations les plus significativement saisissantes, ainsi que dans la forme de quelques-uns des leitmotiv. Au mois d’août 1888, Chabrier croyait que seize mois lui suffiraient pour terminer Briséïs. Six ans et un mois plus tard, il mourut après avoir achevé le premier acte, et n’avoir laissé que quelques ébauches plus ou moins difficiles à déchiffrer pour les épisodes suivants de l’opéra. Il existe plusieurs raisons pour lesquelles Chabrier ne réussit pas à atteindre ce qu’il considérait comme le point culminant de sa carrière. Des retards s’annoncèrent très tôt, causés par le manque apparent de volonté de Mikhaël à se mettre au travail, ce que le compositeur trouvait insupportablement irritant (mais s’il avait su que le malheureux poète allait s’éteindre aux premiers stades de leur collaboration, à l’âge de vingt-quatre ans, il aurait certainement été plus compréhensif). Chabrier était également confronté à des problèmes financiers à cette époque; alors, malgré ses talents médiocres pour l’enseignement, il dut donner des leçons et passer du temps à composer de la musique qu’il pourrait ensuite vendre sans difficulté—de là la composition de quelques-unes de ses plus belles mélodies, comprenant une mise en musique de L’île heureuse de Mikhaël et ses chants de ferme d’après les paroles d’Edmond Rostand et de Rosemonde Gérard. Il devait continuer à voyager en Allemagne où, en grande partie grâce aux efforts de Felix Mottl, ses opéras étaient beaucoup plus demandés qu’en France. La santé déjà délicate de sa femme se détériorait. Le plus grave de tout fut que sa vieille nourrice, Nanine, qu’il adorait plus que tout et qui avait vécu avec lui tout au long de sa vie, mourut en 1891, le laissant incapable de travailler pendant des mois. Peut-être aurait-il pu faire face à ces situations si seulement le problème de base que causait sa maladie finale n’avait pas contrecarré inexorablement tous les efforts suprêmes qu’il fournissait pour exploiter au maximum ses ressources créatives. Lors d’une visite à Bayreuth en 1889, il avait assisté pour la première fois à une représentation de Parsifal, et trouva cela grandiose: «On se retrouve après chaque acte absolument rempli d’admiration, saisi, affolé, des larmes coulant le long des joues.» Si ses premières ambitions pour Briséïs n’avaient pas été de nature «parsifalesque», elles l’étaient certainement désormais. Mais, alors qu’il s’efforçait de travailler sur une échelle structurale et morale d’une envergure jamais envisagée auparavant, la paralysie associée à la phase terminale de la syphilis s’insinuait en lui. Alors même qu’il terminait la composition du premier acte, Chabrier semblait ressentir qu’il ne pourrait se rendre beaucoup plus loin: «Mottl pourrait interpréter le premier acte, dont je viens juste de terminer l’orchestration avant-hier», écrivait-il à Van Dyck en Allemagne, le 29 septembre 1890. «J’ai travaillé à m’en casser les reins», ajouta-t-il sans élégance, mais de façon inquiétante. Il joua ce qu’il avait composé de l’œuvre à ses amis à Paris et partit s’installer à La Membrolle, sa retraite de campagne en Touraine, «pour se cacher comme un animal malade». Ce ne fut qu’à la fin du mois de mars 1894—après une période de plusieurs années passées principalement à La Membrolle, où il pouvait à peine supporter de laisser la partition de sa «chère Briséïs» hors de sa vue—qu’il abandonna finalement le projet et demanda à Vincent d’Indy, le plus capable parmi ses amis compositeurs, d’entreprendre le reste de la composition de l’œuvre pour lui. Cependant, lorsque celui-ci fut finalement appelé à faire le travail, il dut, malgré toutes ses bonnes intentions, abandonner sa promesse. Il avait été effaré de constater que ce qu’il avait pris pour un simple travail d’orchestration était en fait un labeur de composition avec seulement quelques ébauches fragmentées; et, de toute façon, il aurait été impossible qu’il ait pu travailler avec le livret de Mendès. Les héritiers de Chabrier n’obtinrent pas plus de succès avec Antoine Mariotte, Alfred Bruneau, Claude Debussy, Georges Enescu ou Maurice Ravel, qui furent tous invités à terminer l’œuvre à un moment ou à un autre. Mais, comme le compositeur en était lui-même conscient, et comme d’Indy l’avait aussi fait remarquer: «Ce qui existe de Briséïs peut être parfaitement joué et chanté en concert, et sera très intéressant sous cette forme.» Le premier acte fut, en fait, présenté au grand public par Charles Lamoureux lors d’un concert commémoratif en l’honneur de Chabrier, à Paris, le 31 janvier 1897. La première représentation sur scène eut lieu à Berlin en janvier 1899 sous la direction du célèbre Richard Strauss (qui semble s’être quelque peu souvenu de l’œuvre à l’époque où il se mit à composer son Salome) et la première production de l’Opéra de Paris débuta quatre mois plus tard. Malgré les grandes ambitions structurelles de Briséïs, Chabrier préféra quand même construire ses scènes en une succession de sections séparables (sinon exactement séparées). Alors qu’il rejetait la «déclamation» wagnérienne, qu’il considérait extrêmement ennuyeuse, il insista néanmoins à tisser un réseau wagnérien de leitmotiv à travers ses textures orchestrales. Comme il le confessa, ce fut un «travail long et ardu» impliquant «la contorsion et la torture» de thèmes qu’il était déterminé à ne pas présenter en une succession littérale de répétitions. Quels que soient les problèmes, la motivation de Chabrier ne semblait rarement être autre que spontanée. Une fraîcheur apparente, par exemple, est présente dans les sixtes ascendantes et descendantes du chant serein des matelots au début, et le motif «Briséïs»—présenté par les cordes au moment où Hylas mentionne pour la première fois son nom, alors répété sous différentes formes de variantes précédant sa première apparition—est aussi gracieux qu’il est bref. Le message douloureux des harmonies associé à la première évocation par Briséïs de sa mère malade est exprimé clairement par le premier triton. Mais contrairement à cela, l’identité du dieu—chrétien ou olympien—qui a offert à Thanastô un soulagement temporaire à sa maladie et qui est brièvement représenté par une mélodie clairement diatonique dans l’orchestre n’est pas, à ce moment, rendue de façon claire et précise. L’invocation d’Éros par Hylas, les intervalles de sa partition vocale s’agrandissant peu à peu au-dessus d’un ostinato d’octaves qui définissent l’étendue de l’œuvre, est une expression extraordinaire d’énergie païenne. L’un des motifs les plus wagnériens de Chabrier est celui qui, débutant à la basse et bondissant en quintes et quartes, accompagne les serments de Hylas et de Briséïs tandis qu’ils jurent par «l’auguste Kypris» (ou Aphrodite) de s’aimer l’un l’autre jusqu’à leurs derniers jours. De façon plus typique chez Chabrier, et encore plus significative dramatiquement, la phrase legato descendante à trois notes, associée à l’insistance de Briséïs apparemment excentrique mais en fait de mauvais augure, indique que l’amour se doit de survivre au-delà de la mort et de la tombe. Les échos de la joyeuse attente des amants de leur mariage—Briséïs chantant sur les rives, Hylas depuis le bateau—sont combinés avec les répétitions variées du chant des matelots tandis qu’ils partent à nouveau en mer. Plusieurs des thèmes présentés sont révisés dans l’interlude orchestral accompagnant les réflexions de Briséïs, alors qu’elle est laissée seule à la fin de la scène. Les tritons douloureux réapparaissent au début de la troisième scène, dans l’orchestre ainsi que dans les exclamations du chœur de «Hélas!». Un ou deux autres motifs douloureux associés à Thanastô font plus clairement contraste avec la tendresse de la mélodie qui symbolise l’amour de la fille pour sa mère, tandis que Briséïs s’adresse à Thanastô pour la première fois dans «Mère, qui me portais …». Mais la mélodie la plus mémorable de la scène—et potentiellement l’un des thèmes principaux de l’opéra—est la marche triomphante que, dans son zèle missionnaire, chante deux fois Thanastô sur les paroles «Pour qu’au jour des moissons superbes». Si la présence ici d’un clair écho de la Chanson de l’alouette de l’œuvre Le roi malgré lui est extrêmement curieuse, la signification d’un nouveau motif de serment en tierces mineures descendantes, présenté alors que Briséïs promet de donner sa vie pour sauver sa mère, n’est que trop claire. La dernière scène—l’effort créatif suprême de Chabrier—débute par un développement orchestral et une apothéose chorale d’un simple thème diatonique brièvement anticipé plus tôt et maintenant associé avec Apollon. Le Catéchiste entre avec son propre motif dans une fanfare de trompettes et prie pour Thanastô dans un chant grégorien. Mais loin d’insister sur la différence entre les deux, Chabrier combine les thèmes chrétien et apollinien en un grand geste orchestral œcuménique. Le chemin est alors pavé pour une réconciliation finale entre les croyances dans les dieux de l’Olympe, maintenant invoqués avec des harmonies impériales par Stratoklès, et le message chrétien radieux du Catéchiste. Cependant, aucune perspective de réconciliation n’est envisageable concernant le dilemme que Briséïs doit affronter. Après un conflit entre les motifs représentant les deux serments, le sien à Hylas et celui de sa mère à Dieu, elle se voit dans l’obligation de se soumettre à ce dernier et est condamnée à une vie de chasteté, accompagnée par la mélodie représentant son amour pour sa mère et le thème de marche triomphante de celle-ci. Dans son petit livre sur Chabrier, plein d’affection charmante, mais aussi souvent trompeur, Francis Poulenc fournit une brève (et inexacte) description des événements jusqu’à présent, et ajoute, «Je ne sais pas quelles actions se seraient déroulées dans les prochains actes». Mais la réponse se trouve dans le livret, qui fut publié en entier (avec la partition vocale du premier acte) en 1897. Une fois qu’elle prononce les serments chrétiens nécessaires pour sauver sa mère, Briséïs se donne la mort et demande alors à Hylas de la rejoindre dans sa tombe nuptiale—qui, après avoir respiré l’arôme mortel des fleurs qu’elle lui a offertes, le fait joyeusement, à l’étonnement des chrétiens tout comme des païens. Cet enregistrement provient d’un concert donné lors du Festival D’Édimbourg de 1994, au Usher Hall; c’est la première représentation jamais donnée en Grande-Bretagne, et la première en tous lieux depuis longtemps. Goethe nannte seine Ballade Die Braut von Korinth sein „Vampirgedicht“. Zwar besitzt die Ballade tatsächliche ein makabres Element, das stark genug war, einige der ernsthafteren Zeitgenossen zu verärgern. Sie waren wohl der Ansicht, daß ein so großer Geist wie der seine sich höheren Dingen hätte widmen sollen. Es gibt jedoch in der Ballade auch anspruchsvollere Themen, und vom Standpunkt der Oper her ist der gegen Ende angedeutete Liebestod das interessanteste dieser Themen. Um schließlich in der Ehe, die ihnen im Leben versagt war, vereint zu sein, werden die blutsaugende Braut und ihr Opfer, der Bräutigam, auf Anweisung der Braut hin den Flammen des Scheiterhaufens überantwortet. In Korinth bestand eine Spaltung zwischen den zur neuen christlichen Religion der Selbstverleugnung bekehrten, und den Anhängern der lebensfrohen, noch immer auf dem Olymp wohnenden Götter. Das Schicksal des Paares symbolisiert somit den Bruch in der Zivilisation, der dann eintritt, wenn eine Religion im Absinken begriffen ist und durch eine andere ersetzt wird. In den hundert Jahren, die zwischen der Veröffentlichung der Braut von Korinth und der ersten (posthumen) Aufführung des einzigen vollendeten Akts von Chabriers Briséïs vergangen waren, hatte Goethes Ballade sich zu einem kleinen Kultobjekt für französische Schriftsteller und Komponisten entwickelt. Camille du Locle hatte sie als Libretto für Dupratos La fiancée de Corinthe bearbeitet, die 1867 an der Pariser Oper inszeniert wurde; Anatole France hatte 1876 ein Versdrama, Les noces corinthiennes, geschrieben, das eine offene Huldigung an das Heidentum darstellte (Henry Büsser machte daraus dreiundsechs Jahre später eine Oper); und Ephraïm Mikhaël hatte in Gemeinschaft mit seinem Kollegen, dem Symbolisten, Bernard Lazare, an einer „dramatischen Legende“ in drei Akten, La fiancée de Corinthe, gearbeitet, die 1888 in Paris erschien. Als Chabrier sich die Geschichte vornahm, war das Motiv des Liebestods bereits zum beherrschenden Thema geworden, das den Höhepunkt der Handlung bildete. Der Vampir war verschwunden und an seiner Stelle erschien eine Braut, die aus dem Totenreich zurückkehrt, um sich ihren langversprochenen Ehemann zu holen—ähnlich wie in Goethes Balladen, aber hier ohne jegliche „Beutegier“. Diese beiden thematischen Entwicklungen waren bereits in Mikhaël und Lazares La fiancée de Corinthe vorhanden gewesen, und dieses Werk dient daher ganz deutlich als Vorlage zu Briséïs, wenn die Struktur der Handlung auch umgeformt, und die Namen der Personen geändert wurden. Eine bedeutende Verfeinerung innerhalb der Opernhandlung—die wahrscheinlich Catulle Mendès zu verdanken ist—besteht darin, daß die zum Christentum bekehrte Mutter ihre heidnische Tochter zu einem Leben der Keuschheit als Braut Christi verdammt—nicht allein, um ihre eigene Haut zu retten, sondern um ihre Missionsarbeit unter den unbekehrten Griechen fortsetzen zu können. Am bedeutsamsten ist jedoch die Tatsache, daß die am Schluß von Briséïs stattfindende Vereinigung der Liebenden im Tode eine Versöhnung zwischen den streitenden Parteien des Christentums und Heidentums in die Wege leitet. Zwar mag es sein, daß Chabrier Mendès’ literarische Begabung überschätzte, doch war er nicht der einzige unter seinen Zeitgenossen, der dies tat. Debussy sollte durch die modische Beliebtheit hindurchblicken und (wie Dukas es später beschrieb) die „Parnassischen Nippsachen“ darunter erkennen, als er 1892 seine Zusammenarbeit mit Mendès an Rodrigue et Chimène, zu der er schlecht beraten worden war, aufgab. Aber Chabrier war mit den „sehr schönen Versen“, die Mendès für Gwendoline, das erste Opernprojekt der beiden, verfaßt hatte, ganz zufrieden. Außerdem war er voller Zuversicht, daß Briséïs—die er als „eine Paraphrase von Goethes Ballade Die Braut von Korinth, in drei Akten und vier Tableaux“ beschrieb—„zärtlich, ergreifend und von großer Leidenschaft“ sein werde. Chabrier erklärte, daß seine Partitur der letzte Schrei im Modernismus sein werde, und gestand ein, daß er nicht wußte, ob sie französisch klingen werde, aber war sich ganz sicher, daß sie nichts Wagnerisches haben werde. „Ich versuche, mir die Ästhetik dieses bronzenen Mannes zu eigen zu machen“, sagte er, „aber nie seine Musik.“ Tatsächlich ist jedoch seine Musik ihrer Zeit um zehn Jahre voraus und klingt sehr französisch—abgesehen von den Stellen, wo sie zu offensichtlich an Wagner erinnert. Dies ist meistens in den dramatisch signifikanteren Modulationen und in der Form einiger Leitmotive der Fall. Im August 1888 schätzte Chabrier, daß er noch sechzehn Monate brauchen werde, um bis zum Ende von Briséïs zu gelangen. Als er jedoch sechs Jahre und einen Monat später starb, hatte er lediglich den ersten Akt fertiggestellt und ein paar Skizzen für spätere Episoden innerhalb der Oper hinterlassen, von denen nicht alle leicht zu entziffern waren. Es gibt zahlreiche Gründe, warum Chabrier es nicht vermochte, das zu erreichen, was er als den Höhepunkt seiner Lebensarbeit betrachtete. Es gab frühe Aufschübe, die durch Mikhaëls anscheinende Lustlosigkeit, daran weiterzuarbeiten, verursacht wurden, und der Komponist fand diese Verzögerungen unterträglich ärgerlich (allerdings hätte er wohl größeres Verständnis gezeigt, wenn er gewußt hätte, daß der unglückliche Dichter bereits bald nach Beginn ihrer Zusammenarbeit sterben sollte). Außerdem hatte Chabrier zu jener Zeit Geldsorgen: er mußte daher, obwohl er ein hoffnungslos schlechter Lehrer war, Stunden geben und Zeit für die Niederschrift von Musik, die sich tatsächlich verkaufen ließ, aufwenden—dies führte zur Komposition von einigen seiner entzückendsten Melodien, zum Beispiel einer Vertonung von Mikhaëls L’île heureuse und den Lieder vom Bauernhof, die er zu Texten von Edmond Rostand und Rosemonde Gérard komponierte. Er mußte wiederholt nach Deutschland reisen, wo seine Opern viel gefragter waren als in Frankreich, was er größtenteils den Bemühungen Felix Mottls verdankte. Die schon immer schwache Gesundheit seiner Ehefrau verschlechterte sich. Am traurigsten für ihn war, daß seine alte Kinderfrau Nanine, die er ganz besonders liebte und die während seines ganzen Lebens bei ihm gewohnt hatte, 1891 starb. Noch monatelang danach war unfähig zur Arbeit. Wahrscheinlich hätte er mit allen diesen Schwierigkeiten fertig werden können, wenn nicht das grundlegende Problem bestanden hätte, daß seine letzte Krankheit seine schöpferischen Möglichkeiten unerbittlich gerade dann beschränkte, wenn er sich aus Leibeskräften darum bemühte, diese zur vollen Entfaltung zu bringen. Bei einem Besuch in Bayreuth im Jahre 1889 hatte er den Parsifal zum ersten Male gesehen und fand ihn überwältigend: „Nach jedem Akt erliegt man einem Gefühl absoluter Bewunderung, ist verblüfft, außer sich, es laufen einem die Tränen über die Wangen.“ Hätte er nicht bereits den Ehrgeiz besessen, es mit Briséïs dem Parsifal gleichzutun, so besaß er ihn jetzt. Als er sich jedoch dazu zwang, auf einer strukturellen und ethischen Ebene zu arbeiten, die er sich niemals zuvor ausgemalt hatte, bezwang ihn allmählich die Lähmung, die ein Symptom des letzten Stadiums der Syphilis ist. Schon während der Fertigstellung des ersten Akts schien Chabrier zu ahnen, daß er nicht viel weiterkommen würde: „Mottl könnte den ersten Akt aufführen, dessen Orchestrierung ich gestern abschloß“, schrieb er am 29. September 1890 an Van Dyck in Deutschland. „Ich habe bis zum Umfallen daran gearbeitet“, fügte er wenig elegant aber bedeutungsvoll hinzu. Er spielte seinem Freundeskreis in Paris das vor, was von dem Werk vorhanden war, und zog sich auf seinen Landsitz in La Membrolle in der Touraine zurück, „um sich wie ein krankes Tier zu verstecken“. Erst in den letzten Märztagen des Jahres 1894—nach einer Zeitspanne von Jahren, die er hauptsächlich in La Membrolle verbracht hatte, wo er es kaum ertragen konnte, die Partitur seiner „lieben Briséïs“ aus den Augen zu lassen—gab er endlich auf und brachte Vincent d’Indy, den fähigsten unter seinen komponierenden Freunden, zu dem Versprechen, das Werk für ihn fertigzustellen. Als schließlich die Zeit für ihn kam, diese Arbeit auszuführen, mußte sich d’Indy trotz aller guten Vorsätze von dem Versprechen lösen. Er war entsetzt, als er herausfand, daß es sich bei der Arbeit nicht, wie vorgegeben worden war, um Orchestrierung, sondern um Kompositionsarbeit anhand einiger weniger bruchstückhafter Skizzen handeln würde; hinzu kam, daß er unmöglich mit Mendès’ Libretto arbeiten konnte. Chabriers Erben hatten kaum mehr Glück mit Antoine Mariotte, Alfred Bruneau, Claude Debussy, Georges Enescu und Maurice Ravel, die alle zu irgendeinem Zeitpunkt dazu eingeladen worden waren, die Arbeit an dem Werk abzuschließen. Aber, wie der Komponist selber erkannte, und wie d’Indy so weise bemerkte: „Was von Briséïs existiert, kann perfekt im Konzert vorgetragen und gesungen werden und wird in dieser Form sehr interessant sein.“ Der erste Akt wurde in der Tat bei einem Gedächtniskonzert für Chabrier am 31. Januar 1897 in Paris von Charles Lamoureux der Welt vorgestellt. Die erste Bühnenaufführung fand im Januar 1899 unter der Leitung von niemand anderem als Richard Strauss statt (der sich anscheinend an gewisse Eigenschaften des Werkes erinnerte, als er später seine Salome verfaßte), und die erste Inszenierung an der Pariser Oper wurde vier Monate danach eröffnet. Trotz seiner großangelegten strukturellen Vorhaben in Briséïs zog Chabrier es vor, seine Szenen als eine Folge trennbarer (wenn auch nicht exakt getrennter) Nummern aufzubauen. Zwar verwarf er die „Deklamation“ im Stile Wagners, da er diese als sehr langweilig empfand, aber bestand trotzdem darauf, in Wagnerscher Manier durch sein orchestrales Gewebe ein Netz von Leitmotiven zu knüpfen. Wie er eingestand, war dies „eine lange und sorgsame Arbeit“, bei der jene Themen, die er absolut nicht in Form wörtlicher Wiederholungen präsentieren wollte, „verdreht und gequält“ wurden. Zwar mag es Probleme gegeben haben, aber Chabriers Motivation wirkt fast immer sehr spontan. Zum Beispiel besitzen die steigenden und fallenden Sexten des heiteren Seefahrerliedes zu Anfang eine ansprechende Frische. Auch das Briseis-Motiv—mit dem die Streicher an dem Punkte einsetzen, an dem Hylas zuerst ihren Namen erwähnt, und das dann vor ihrem ersten Auftritt in allen möglichen Varianten wiederholt wird—ist zugleich graziös und prägnant. Die schmerzliche Botschaft jener mit Briseis erster Erwähnung ihrer kranken Mutter verbundenen Harmonien ist vom ersten Dreiklang an unüberhörbar. Allerdings wird dem Hörer an dieser Stelle nicht deutlich gemacht, welcher Gott es ist—der Gott des Olymps oder der des Christentums—der Thanasto eine zeitweilige Linderung ihrer Krankheit verschafft hat. Er wird nur kurz mittels einer streng diatonischen, vom Orchester gespielten Melodie dargestellt. Hylas’ Anrufung des Eros, in welcher sich die Intervalle seiner Vokalzeile allmählich über einem Ostinato von hüpfenden Oktaven ausdehnen, stellt eine bemerkenswerte Verkörperung heidnischer Energie dar. Eines der eher nach Wagner klingenden Motive Chabriers ist dasjenige, welches in Quinten und Quarten aus dem Baß hervorschreitet und die von Hylas und Briseis dem „l’auguste Kypris“ geleisteten Gelübde begleitet, einander bis ans Ende zu lieben. Charakteristisch für Chabrier und dramatisch bedeutsamer ist die legato gespielte, aus drei Noten bestehende abfallende Phrase, welche mit Briseis’ scheinbar exzentrischem, aber tatsächlich schicksalsschwangeren Bestehen darauf assoziiert wird, daß die Liebe über den Tod hinaus und ins Grab hinein überleben müsse. Echos der freudigen Erwartung, mit der die Liebenden ihrem Hochzeitstag entgegensehen—Briseis singt von der Küste, Hylas vom Schiff her—werden, als sie wieder in See stechen, mit einer variierten Reprise der Seefahrerliedes kombiniert. In dem orchestralen Zwischenspiel, das Briseis’ Gedanken begleitet, als sie am Ende der Szene allein gelassen wird, werden mit mehreren der voraufgegangenen Themen wiederaufgenommen. Die leidvollen Dreiklänge tauchen zu Beginn der dritten Szene wieder auf, sowohl im Orchester als auch in dem vom Chor ausgerufenen „Hélas!“. Ein paar weitere mit Thanasto verbundene schmerzliche Motive bilden einen wirkungsvollen Kontrast zur zärtlichen Melodie, welche die Liebe der Tochter zur Mutter symbolisiert, als Briseis Thanasto zuerst mit den Worten „Mère, qui me portais …“ anspricht. Aber die denkwürdigste Melodie der Szene—die potentiell eines der Hauptthemen der Oper hätte abgeben können—ist die triumphierende Marschmelodie, die Thanasto in ihrem missionarischen Eifer zweimal zu den Worten „Pour qu’au jour des moissons superbes“ singt. Zwar ist die Gegenwart eines deutlichen Echos auf das Chanson de l’alouette aus Le roi malgré lui auf ärgerliche Weise verwirrend, doch ist die Bedeutung eines neuen Gelübde-Motivs nur zu unverkennbar. Dieses trägt die Form absteigender kleiner Terzen, und erklingt zuerst an dem Punkte, als Briseis gelobt, ihr Leben für die Rettung ihrer Mutter zu opfern. Die letzte Szene—Chabriers eindrucksvollste schöpferische Leistung—beginnt mit der orchestralen Entwicklung und choralen Apotheose eines einfachen diatonischen Themas, das vorher kurz vorweggenommen wurde und jetzt mit Apollo in Verbindung gebracht wird. Der Katechist setzt mit seinem eigenen Motiv in einer Trompetenfanfare ein und betet—im gregorianischen Gesang—für Thanasto. Doch besteht Chabrier ganz und gar nicht auf dem Unterschied zwischen christlichen und apollonischen Themen, sondern vereint beide in einer großartigen ökumenischen orchestralen Geste. Auf diese Weise wird der Weg für die schließliche Versöhnung zwischen den beiden Religionen gebahnt: zwischen dem Glauben an die olympischen Götter, die jetzt mit kaiserlichen Harmonien von Stratocles heraufbeschworen werden, und der strahlenden christlichen Botschaft des Katechisten. Es gibt jedoch keinerlei Aussicht auf Lösung des Dilemmas, in dem Briseis sich befindet. Nach einem Konflikt zwischen den beiden die Gelübde symbolisierenden Motiven—ihr eigenes Gelübde und das ihrer Mutter zu Gott—sieht sie sich gezwungen, dem letzteren nachzukommen und wird demzufolge zu einem Leben der Keuschheit verbannt. Dabei begleitet sie jene Melodie, die ihre Liebe zu ihrer Mutter darstellt, sowie das mir der Mutter assoziierte Marschthema. In seinem liebevollen, aber oft irreführenden Büchlein über Chabrier gibt Francis Poulenc eine kurze (und nicht sehr genaue) Beschreibung der vergangenen Geschehnisse und fügt sodann hinzu: „Ich weiß nicht, was in den folgenden Akten passiert wäre.“ Aber es ist alles im Libretto, das 1897 vollständig gedruckt wurde, (und das die Vokalpartitur für den ersten Akt enthielt) vorhanden. Als Briseis die zur Rettung ihrer Mutter notwendigen christlichen Gelübde geleistet hat, tötet sie sich und ruft dann Hylas dazu auf, ihr ins Ehegrab nachzufolgen, was er (nachdem er den tödlichen Duft der Blumen, die sie ihm hinhält, eingeatmet hat) auch freudig tut—zum Erstaunen von Christen und Heiden gleichermaßen. Der vorliegenden Aufzeichnung liegt eine Konzertaufführung, die beim Edinburgher Festival von 1994 gegeben wurde, zugrunde. Dies war die Erstaufführung in Großbritannien, und zugleich die erste, die seit langer Zeit an irgendeinem Orte stattgefunden hatte. Vers le golfe aux îles perlières. dans l’intervalle des collines de sable. towards the bay of the pearly islands. can be seen between the sand dunes. En avant de notre carène. Les tempêtes et la sirène. in front of our hull. Notre nef rouvrira son aile un instant close. our ship will reopen its briefly closed wings. La vierge Briséïs, mon amour et mon vœu! the maiden Briseis, my love and my troth! Rêvent à tes lèvres amies. you sleep, my fair-haired betrothed! dream of your friendly lips. Se mêle aux rumeurs de la vaine brise? mingling with the murmur of the vain breeze? Briséïs: Hylas! Ô joie! Encore ici! Par un mal sans merci. Mais un Dieu la secourt: elle dort, apaisée. Et tu m’appelles! Me voici! Briseis: Hylas! O joy! You are still here! But a God has come to her aid: she is asleep, soothed. And you call for me! Here I am! Hylas: Éros! Chaleur! Lumière! Universelle sève! Prince des hommes et des dieux! Briséïs: Hylas! Mon fiancé … Bonté des dieux célestes! C’est toi! Tu ne pars pas? Je ris, puisque tu restes. Comme aux fleurs les rayons, il me faut tes regards! Hylas: Eros! Ardour! Light! Universal life! Prince of men and of gods! Briseis with the beautiful eyes! Briseis: Hylas! My betrothed … The gods in heaven are kind! It’s you! You are not leaving? I rejoice that you are staying. Just as flowers need the sun, I need your eyes to turn on me! Hylas: Enfant! Nous connaîtrons l’absence aux jours funestes. Je voulais te revoir encore … Mais je pars. Briséïs: Peux-tu partir, m’ayant revue? L’époux qu’accueillera le gynécée en fête! Vers les richesses de Syrie. Au matin des noces heureuses! Entendre au loin l’éveil des tempêtes haineuses! Comme un oiseau glissant le long des lacs fleuris. Hylas: Child! We will soon know the sad days of absence. I wanted to see you once again … But I am leaving. Briseis: Can you go, having seen me again? husband who will be welcomed by the festive bridal chamber! to reach the riches of Syria. on our happy wedding morning! I can hear hateful storms stirring far away! like a bird gliding over the water of flowery lakes. À la caresse de tes bras. you have heard what my lover said! Mais c’est trop peu d’aimer jusqu’aux sommeils funèbres! Il faut aimer encor par delà leurs ténèbres. But it’s not enough to love until the sleep of death! We must go on loving beyond its shadow. Pour sourire à ton cher retour. De t’endormir près d’elle au tombeau nuptial. Rêver l’affreuse mort quand la vie est heureuse? to smile at your dear return. to go and sleep beside her in the nuptial tomb. why you dream of frightful death when life is so happy? Briséïs: Tu dis vrai. Demain nous sourit. Laisse-moi respirer le parfum de ta main. Briseis: You are right. The future is bright for us. Let me breathe the perfume of your hand. Laisse mon cœur se fondre aux rayons de tes yeux. Let my heart melt in the gleam of your eyes. Hylas: … Les vierges criront: Hyménée! Briséïs: … Et nos cœurs le diront tout bas. Briséïs & Hylas: Hyménée! Hymen! Hyménée! De lever l’ancre et de hisser la voile! Briseis: … and our hearts will quietly say it to each other. Briseis & Hylas: Hymenaeus! Hymen! Hymenaeus! to lift the anchor and hoist the sail! Sois témoin, ô dernière étoile! Briséïs & Hylas: … D’un immortel amour! Hylas: Let us repeat the vow. Be our witness, O last of the stars! Briseis & Hylas: … with an immortal love! Des servantes (dans la maison): Hélas! D’autres servantes (plus près): Hélas! Une servante (sur la terrasse, les bras levés): Réveil affreux! Une autre servante: Nuit inclémente! La voix de Thanastô: Je meurs! En secouant ses cheveux gris! Briséïs (s’élançant): Ce n’est pas vrai! Sont vains et vos plaintes sont vaines. Ô mort, dans mes veines! Maidservants (in the house): Alas! A maidservant (on the terrace, arms raised): A frightful morning! Another maidservant: A dreadful night! Briseis: What is the cause of all this noise? The voice of Thanasto: I’m dying! Ah! Stratocles, speak to me! your mother … Her pain is getting worse! shaking the grey hair of her head! Briseis (running forwards): It cannot be true! is useless just as your crying is useless. who are running in my veins! Ô mère, ne meurs pas! O mother, do not die! De la tombe … Jésus, épargne ta servante! Toi qui souffris, toi qui pleuras, Christ, vois mes pleurs! Ils invoquent les dieux, nos uniques soutiens. of the tomb … Jesus, spare your servant! you who suffered, you who wept, Christ, see my tears! they invoke the gods, who alone support us. Quel est donc le Dieu qu’elle nomme? Stratoklès: Hélas! C’est le Dieu des chrétiens! Mais non! Je n’ai pas peur du trépas qui délivre! J’accepte le martyre et j’aime le tourment. Sauve-moi pour sauver les âmes, Dieu clément! C’est pour donner la vie à tous que je veux vivre! So who is this God she names? Stratocles: Alas! it’s the God of the Christians! But no! I am not afraid of liberating death! I accept martyrdom and I welcome pain. Save me to save the souls of others, merciful God! It is to give life to every one that I want to live! La grange de ton Paradis! Briséïs: Mère, reviens à toi! Dispersera la nuit sans chasser ma détresse! Ah! le mal plus affreux s’acharne, sans repos! Les servantes & les serviteurs: Thanastô! Mon cœur est un tison! the granary of your Paradise! Briseis: Mother, come to your senses! will disperse the night without dispelling my distress! Ah! the most frightful pain has me in its grip! My heart is a burning brand! La vierge Briséïs n’est pas encore chrétienne. Vieillards, portons-la sur sa couche. the virgin Briseis, is not yet a Christian. Old men, let us carry her to her bed. Je suis prête à donner ma vie. Parfois d’un long regret la parole est suivie. Vierge, implore les dieux,—s’il est des dieux encor! I am prepared to give my life. Sometimes one’s words are followed by a long regret. maiden, go pray to the gods—if there are still any gods! Comme vers un héros des appels de captives. Sur les suppliantes en pleurs! Surgis contre la mort sur le seuil de nos portes! like the pleas of captives towards a conquering hero. to the tearful suppliants before you! rise against death which threatens our house! La jeune force et la santé. Viens, sauveur, dans la gloire ardente de l’aurore! her youthful strength and her health. come to us, saviour, in the warm glow of dawn! Le Catéchiste: Celui qui sauve, le voici! Les servants: Qui donc nous apparaît dans le ciel éclairci? The Catechist: The saviour is here! Maidservants: Who is this appearing in the light of the sky? Toi qui ressuscitas la fille de Jaïr! Jésus, prends en pitié celle qui va mourir. you who brought back to life the daughter of Jairus! Jesus, have pity on a woman who is about to die. Un autre serviteur: Où vas-tu? Il n’entre en nos maisons! Tous les serviteurs: Va-t-en! Va-t-en! Soit avec vous, mes frères! Quel est ce pâle et doux visiteur qu’on redoute? A servant: He should leave! Another servant: Where are you going? All the servants: Go away! Go away! Briseis: Old men, why are you trembling? Who is this pale and gentle stranger who is so feared? La joie et la beauté rayonnent sur la terre. joy and beauty shine on the earth. Semblait faire éternelle et sans borne la nuit. Briséïs: Vieillard, la voix mentait! À cause de l’Enfant qu’une étable a vu naître. Et qui n’aime pas la vie. Et les caresses des amants. Comme un jardin sans roses. seemed to make the night limitless and eternal. Briseis: Old man, the voice was lying! because of the Child born in a stable. and who does not love life. like a garden without roses. on the joy of living. Ô Seigneur, qui vous êtes! Pour le salut des pécheurs anxieux. Fut le signal qui fit s’ouvrir tout grands les cieux! Du Paradis, il vous fait signe et vous attend! O Lord, who you are! for the salvation of unhappy sinners. was the signal which opened wide the heavens! of Paradise, he is beckoning to you and waiting for you! Briséïs: Ton Dieu sauvera-t-il ma mère? Le Catéchiste: Elle est guérie si tu le veux. Et dénouez selon le rite vos cheveux! Pour parer l’autel de ce nouveau Dieu! Le Catéchiste: L’offrande qu’il désire, ô Vierge, c’est toi-même. Elle vivra si tu me suis. Qui de leurs tristes mains n’osent toucher les roses! Le Catéchiste: Viens prier pour nous! Puisent insolemment aux fontaines sacrées! Briseis: Will your God save my mother? The Catechist: She is cured if you want it. in white, and untie your hair according to the rite! to decorate the altar of this new God! The Catechist: The offering he wants, O Virgin, is you yourself. has pledged you to baptism. If you follow me she will live. to the one and only God. who dare not touch roses with their sad hands! The Catechist: Come and pray for us! so insolently take from the sacred springs! Le Catéchiste (s’approchant de Briséïs): Viens! Non! J’ai pour époux Hylas! Entends-tu, prêtre? Me voler à mon maître! Ma mère ne m’a pas vouée à Christ! Tu mens! The Catechist (approaching Briseis): Come! No! Hylas will be my husband! Do you hear, priest? and steal me from my master! My mother has not pledged me to Christ! You are lying! Sois l’épouse de Dieu, vierge éternellement! Briséïs: Oh! mes espérances flétries! Et les pâtres des tes praîries. Le voile des noces fleuries. be the bride of God, a virgin in eternity! Briseis: Oh! my withered hopes! and the shepherds in the meadows. Tu promis de sauver mes jours! Thanastô: Gloire à Jésus! Chantons des hymnes de victoire! You promised to save my life! Thanasto: Glory to Jesus! Let us sing hymns of victory! O supreme, O powerful God!